When a Christian unwed teen tells her parents she is pregnant. I found this article very interesting because I know of at least one instance where the failure of parents to react with grace to such news had long lasting adverse effects. Do you know of parents or unwed mothers who faced this and what the outcome was? IMO it is a situation that any girl's parents might face. I know something about this. You see, once upon a time, I was Maddi Runkles. I also became pregnant outside of marriage while barely out of my teen years. Rebelliousness had set in and I skated in sin believing the big lie that there were more pleasures to be found in this world than in God. Driven by fear I hid my pregnancy for five months, and I knew that the shame and guilt I carried would only amplify -- plus usher in condemnation once others learned my secret. Was I up for this? Like Maddi Runkles I was raised in a Christian home where we upheld Christian principles and embraced Biblical values. In fact my father was a pastor -- and this further enhanced my anxiety as I struggled to tell my parents about my pregnancy. It weighed heavily on me, especially in knowing that another decision - a secret one to not have my baby could rid me of being shamed by others. My father’s shoulders sagged and he hung his head. Momentarily we sat in silence, me holding my breath awaiting his reaction while wearing the weight of his certain disappointment and possible anger. Then there was the indescribable and overwhelming feeling of shame that washed over me in waves. Now it was my turn to hang my head. “And you have made poor choices which now have consequences,” he continued. Wait, what?! My mouth was agape. Before I could respond my father got up from his chair and reached over and wrapped me in his arms and simply held me. It was just what I needed and not anything I expected. What I encountered was something I had never fully grasped before though I had been taught for years. I didn't get what I deserved, but I certainly fully received what I had been taught. Grace swept over me and unleashed its power connecting both with my head and and my heart. The only way I can describe it is that grace is the gift of a big exhale. -- Holding one’s breath and waiting for what most certainly should come to receiving a “get free pass” that one would absolutely not expect. That grace moment propelled my life in a new direction. I confessed my sins, I cleaned up my act, and I charted a new course fanned by the winds of grace and truth spoken in love. My father was right, I did choose a hard path and there were struggles ahead, but when I look into my son’s beautiful eyes, I am so glad I made the right choice, after I made a wrong one. Through the years, and because of grace, I have served many unwed teen moms and even incarcerated moms teaching them the lessons I have learned regarding truth and grace while spoken in love. Here is one of my mottos, which that I have shared weekly with the incarcerated moms: A leopard cannot change its spots, but I assure you that a caterpillar can turn into a butterfly. Grace has the power to change one within which unleashes the feeling of freedom and propels one in a positive direction. Not the opposite. In our film, “Because of Grácia,” one of the characters, Bobbi Ryan, faces a test similar to the one that Maddi Runkles and I, and millions of other young women, have faced. We also tell the story of another young woman, Gracia, who makes better choices. In both cases, God is glorified in the end because grace and mercy triumph over death and destruction -- and while our paths may be easier when we make the right choices, God is there to gently restore when we stray. Publicly shaming Maddi Runkles and not allowing her to walk in her graduation ceremonies will not change anyone else for the better, just as having allowed her to participate in graduation ceremonies would not have likely prompted young girls to get pregnant. Shame didn’t teach me. Grace did. And I didn't learn grace by hearing about it, but by being the recipient of it. Maddi’s life may be far more difficult than her classmates who will wait and do things in God’s proper time and order. But letting them walk together could have been a God-honoring moment that communicated grace, not license to sin and a reminder that grace doesn't glorify sin, it simply covers it and glorifies God. Photo captions: 1) Maddi Runkles on TV. 2) The author with her infant son. (Courtesy of the author). 3) The author with her son. (Courtesy of the author). 4) Movie poster. 5) The author today. (Courtesy of the author). Note: Angel Hatfield is available for select media interviews. For more information please contact Bethany@mjmgroup.com , 310.601.7857 x 7001 office | 310.853.2851 cell. About the writer: Angel Holscher Hatfield is executive producer of Because of Gracia, which releases in theaters nationwide on September 15, 2017. * This story was originally published by Fox News (http://www.foxnews.com/). ** You may republish this and any of our ANS stories with attribution to the ASSIST News Service (www.assistnews.net). Please also tell your friends that they can also receive a complimentary subscription to our news service by going to our ANS website and signing up there. On changing Bible versions and the next one. If I believed in numerical progression I should find out about the intermediate state in 2032 or 2040. But no-one knows when they will cross over. Like the second coming, it could be later today. Realistically one might expect more signs of my departure than that of the Lord's return. 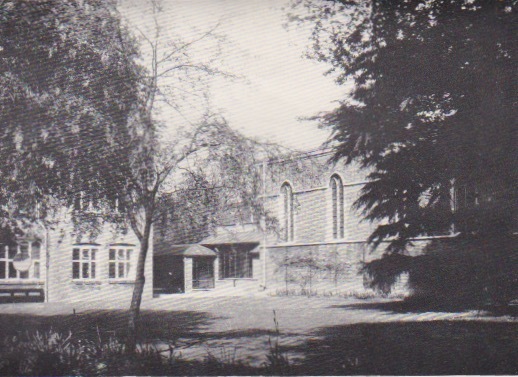 On 14 July 1912, Adeline, Duchess of Bedford laid the foundation stone of The Chapel of the Holy Cross, to serve the nuns and girls housed in St Helena's Home, West Ealing. The architect, Sir Nina Cooper built in the style of the first ever buildings erected for churches, Roman basilica. 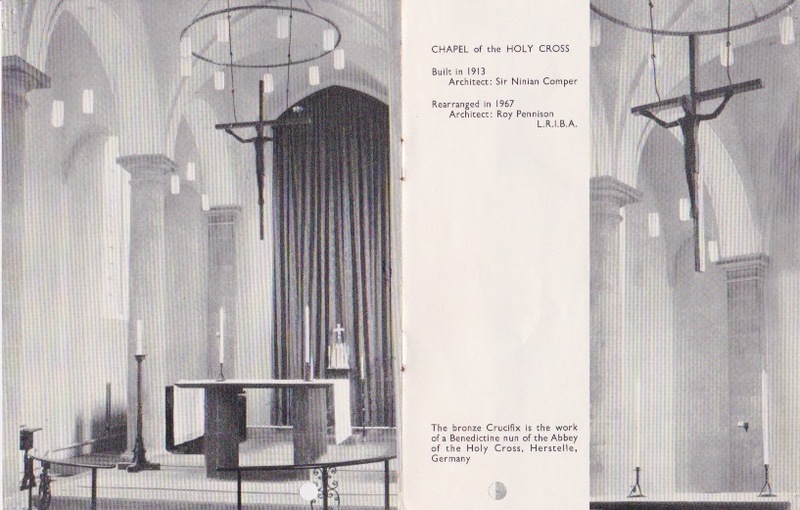 Buying the premises in 1979, the International Presbyterian Church within the tradition of reformation iconoclasm, removed crucifix and alter. Note it was an altar not a table. I am told it was incorporated into the patio of a church member. When the convent building was to be demolished for social housing, the local civic society called in English Heritage. They said the main building was of no merit but placed a Grade II listing on the chapel. Chapel, convent and linking corridor. The pictures date from after 1967 when the chapel was rearranged by architect Roy Pennison. The cedar was cut down illegally by developers who bought the convent building, selling it to Notting Hill Housing Trust for demolition. It was well over 100 years old. I have a copy f the 1919 report of St Helena's Home. 30 June 1896 the foundation stone had been laid. October 6 1897, home, laundry and a chapel were opened. Ours is the later chapel. The home accommodated up to forty girls to save them from prison, mainly for theft. Ages were 14 to 25. They stayed two years learning housework, needlework, laundry and cooking. 27 girls entered in 1919. 33 in the house suffered from the world wide flu epidemic but no deaths recorded. Five girls left for service, one to nurse, one telephonist and ten returned to their friends. The home rightly claimed a better record of rehabilitation than that of prison. The chapel was typically anglophone-catholic with architecture for sacrament not preaching. Preaching is best with a flat ceiling, solid wall behind the preacher and no echo. The IPC installed wall hangings to stop the echo. I have a photo of a mosaic which looks like an icon of a female. 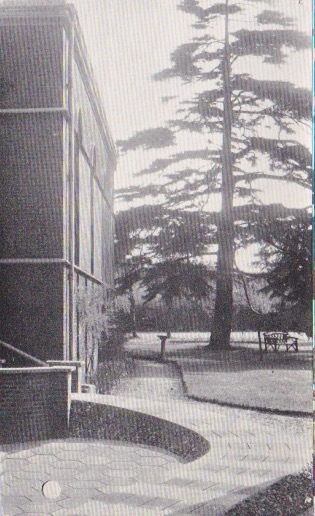 Does anyone know if this was taken by the nuns who returned to Wantage? Some years ago half of the left for a Roman order. Lots of hype about this and reviews read and reports from friends all good except for the secularisation, missing out the national day of Prayer from Evangelicals now. My first thing to say is that us going to the cinema is a rare event. Last there on the opening day of Les Mis. Nothing intros visit is likely to persuade me to take up cinema good. First moan. Due Cinema's; online booking is user extremely unfriendly if you have to enter voucher codes. I probably took almost as long to book online plus three phone calls as it did to watch the film. Seats comfortable but as before, sound unpleasantly loud, commercials pushy for consumer goods on sale in foyer and interminable trailers for films to come, most of which I would pay to stay away from. Sci/fi and fantasy utter rubbish. But to Dunkirk. The first film I have seen which is meant to give you an experience. It assumes you know the story. Hundreds of thousands of troops stuck on the beach.The German army resting its tanks allows the Luftwaffe to strafe and bomb like ducks set up in rows. The discipline is extraordinary. Dialogue is minimal. The viewer is to let it all wash over them. The poor soldiers complain about lack of RAF protection. The RAF had to stay and protect its bases. It was a fight for the whole war, not only this battle. It ended with Churchill's speech. I would have liked to have heard the quote from the commander of the operation. It is on the wall of his command post in Dover castle and is to the effect that, "It is sometimes granted to a general to command a victory, but not a miracle'. Over 300,000 evacuated not the tens of thousands expected.A miracle? Yes if you believe God commands the weather. I noted two things missing. Prayer. I do not recall anyone praying. Badly unrealistic. Welcome unrealism. No swearing. One more absence. No Americans. Enough said of late arrivals to partys.. Other near absences - one person of colour. Probably proportionate. A handful of women, nursing or making tea and sandwiches. Proper place during combat. Final thoughts are two. I am thankful I was born after the end of the war and not before it like my father.Then the amazing absence of my father from that beach. All the Royal Artillery recruits with whom he trained finished up on the beech. Gunner Weeks, my father, and his sergeant, Day, were the two not sent to France. Dad reckons some officer had a sense of humour missing out Day and Weeks. Dad was sent to Yorkshire, met my mother and so I can write this ramble of a review. A film to be experience but one viewing is enough for me. My return to view on the big screen could be years away. In a representative democracy with a first past the post system you elect one person as your representative as say MP or councillor. One often hears things like, "Women are under-represented' meaning there are fewer women than men elected. But your representative is there as a human being representing you as a human being. Men may represent women. The imbalance is not a sign of male chauvinism but of the problems peculiar to women in standing as representatives like the time taken up by duties caring for the family. Similarly to say various ethnicities or religions are under-represented assumes wrongly that only a person of a given ethnicity or religion can represent people with those backgrounds. But that is not the way it works. However, when the mix among the representatives differs widely from the mix in the constituency there may be a problem. I had a look at Ealing Council. I have not as yet looked up the statistics for Eaing's ethnic and religious diversities but there are very diverse populations. From a quick personal survey of the councillors listed in Around Ealing, I estimate 28 out of 69 are British Asian, 41 are white British or Irish. The estimated religious mix is 8 Muslim, 8 Sikh 11 Hindu and the rest 42 Christian or other religion or none. I do not see any great imbalances here except in a few wards including my own, Perivale,where all three councillors are British Asian with two Muslim and one Hindu. Those diversities or lack them are not a mirror of the Perivale population. Should one be concerned? BTW 23 out of 69 councillors are female. Today I met a Vietnamese family, mother and two daughters. The elder daughter awaits results of an MA in law at Bristol. She told me it was rare to find a British person who could talk about Vietnam's history. I explained I had been a young graduate when Vietnam was constantly in the headlines. It turned out that her grandfather was a war hero, decorated for rescuing a Vietcong fellow soldier when under fire from the American enemy. I said how grateful I was that the UK was not involved in the war as it was my American contemporaries who were drafted or dodging one way or another. Like the Presbyterian who could claim he was still a Mennonite and so join the peace corps instead. I think it was the working class, black and white who were drafted. I found out the reasons the two sides fought were very different. I remember the great American fight to stop the spread of communism. My Vietnamese friends said it was all about American colonialism and imperialism. 'Wad some power the gift tae give us tae see ourselves as others see us.' I said the way the war was conducted was unpopular here and eventually in US too. Once again the unseasonable weather continues. It is beautifully sunny and warm on a Bank Holiday weekend. Gethin Jones our second assistant minister (this is the first time our church has had a minister and two assistants working full time) preached morning and evening from Ruth 4 and 1 John 1-2. Evening service we were for the first time at Dean Hall. This century old building s the only one of its vintage in the middle of an estate of social housing flats adjacent to the main Uxbridge Road through West Ealing. On foot it is less than half a mile from our chapel but that is a walk by footbridge over the Paddington main line tracks. On Sunday mornings a small Brethren assembly meets there but the active elder and trustee, Davis Smith, has worshipped at IPC on Sunday evenings for several years and he is allowing us to use Dean Hall Sunday evenings and fall all our activities throughout the week until our new building is finished,. This is a wonderfully gracious provision for us and we trust will be a blessing on the witness of Dean Hall. I forgot the camera so pictures to follow. We has both our assistant ministers to lunch. The other man, Chris Roberts, is a big fan of my tandoori chicken which I cooked for lunch. Both Gethin and Chris are under care of our IPC presbytery, that is they are in training for ordination. Went to view our new house. Had arranged a time via the agent. Knocked and knocked as three was a car at the front. Eventually an elderly oriental lady opened the door. She knew nothing of our visit. She was an AirB&B tenant. She had little English. Her daughter, a Vietnamese MA student at Bristol let us in. We had a good chat on Vietnam and its history, especially the war. But though we looked round we could not enter one room which was locked. Was the owner there? We left with me fuming at this vendor who had kept Deb and I waiting two weeks to view his property. David arrived with our two Canterbury grandchildren and their dog Inki who has changed my outlook on small dogs. I had not been a fan until Inki who is so friendly and quiet. Too quiet sometimes. It is too easy to tread on her. Only then is she noisy, or when she sees another dog. David dropped me at the Town hall for an excellent lunchtime talky an Anglican from Tunbridge Wells. At present I am banned from driving, not be the law but by Katy. Is it my bad legs, heart or sight that bothers her. I am happy to be a passenger, a driven man. In the evening, after an excellent if rushed Indian takeaway, we went to the cinema for Dunkirk.See this experience reviewed on this blog. David and family were visiting a friend in the morning leaving the dog here which complicated life when Deb brought her three Levy children for the day. Their home is being extended and electricity was disconnected. Is I taught Noah and Ellie how to play Uno which they seemed to enjoy. They were afraid of Inki but their little sister Phoebe, a Dons child, was more at home with the dog. In the evening Debbie kindly took me to or first ever IPC prayer meeting at Dean Hall. See pics on FB. Excellent time of prayer led by assistant minister, Gethin. Viewed the new house with the agent there saw all of it. Photos added on FB. David and family returned home to Canterbury. My fellow elder, Paul Meiners and his wife Liz, PCA missionaries, drove us down to our church in Hampshire for the installation of their new pastor, James Buchanan who is a former Anglican ordinand and was an elder in our Derby church. He is IMO a brave man spiritually to take on Loss IPC. Over 20 years ago all the elders and the majority of the congregation left over whether you could be a Presbyterian church yet have Baptist elders and a pastor who no longer believed that the baptism of covenant children was a necessary part of the system doctrine taught in the Westminster Confession. More recently there has been the departure of all the recent session's elders for various reasons. Ealing IPC is now responsible for the well being of the church in Liss until James can train and have a new session of elders ordained. We pray for his ministry and the unity of the church there. It was an encouraging service and we were pleased to meet up with old friends afterwards as well as making new contacts. Photos on FB earlier. As I do not believe there are any signs to be observed to indicate the immanence of the parousia I totally dissent from seeing prophetic significance in the eclipse or any recent history,especially the establishment of the state of Israel. But the first part is spot on. LONDON, UK (ANS – August 25, 2017) -- After more than 150 years of continuous chiming on the hour, Big Ben has temporarily ceased to gong. And I believe it begs the question of whether time is running out for the once Great Britain. The four-year moratorium on the famous bell is so that repairs can be made without bursting the eardrums of the workers. And judging by the TV footage I have seen, there are serious cracks in the structure. And yet MPs, including Prime Minister Theresa May, have protested at what they consider to be this unnecessary deference to health and safety regulations. This speaks rather aptly of their not wishing to face up to the decadence of our nation: short-term thinking that spells eventual disaster. The general wisdom on political matters is that ‘if it’s not broke, don’t fix it’. But it surely does not apply in this case. However, I do feel that God is speaking clearly through this episode – and it’s more than a facelift we need. There has been talk for some time about MPs having to move out of the Commons while repairs are made to the crumbling foundations adjacent to the iconic clock. But that conversation has also gone rather quiet. All of which is a perfect picture of the state of the nation thanks in large part to the diabolical laws passed in these hallowed buildings. What a shocking betrayal of our esteemed forefathers who, inspired by their Christian faith, campaigned for laws -- including the abolition of slavery and child labour -- that set an example of moral righteousness to the rest of the world. But in the past 50 years we have seen Parliament agree to one law after another that flatly contradicts biblical truth along with everything we have stood for as a nation for hundreds of years. Among the most heinous of these was the Abortion Act, which has seen the legalised murder of nine million unborn children. And yet, in our topsy-turvy politically-correct world, we have heard little about the horrors of this subject 50 years on while at the same time being bombarded with “celebrations” of the decriminalisation of homosexuality – another law passed in 1967. Life is cheap while evil is flagged up as good, and good as evil (Isaiah 5.20). We are on shaky ground indeed, quite literally in the case of our Parliament, once the envy of the world. Unless our leaders -- political and spiritual -- face up to our moral decadence and make way for major repairs in the form of a return to the Rock of Christ on which our civilisation was built, the whole Westminster edifice and all it stands for may come crashing down around our ears. After all, evangelist Billy Graham is reputed to have said that if God doesn’t judge America, he will have to apologise to Sodom and Gomorrah. Yes, the eclipse is a wondrous, awesome sign – but also a fearful one, in the light of God’s word which shall never fail (Isaiah 40.8). For the God of creation is also the God who cannot look on evil; that is why he turned his face away when his Son bore our sins on the cross, causing our Lord to declare in his agony: “My God, my God, why have you forsaken me?” quoting Psalm 22.1. Our sins were judged on the cross; they were condemned in fact. But if we trust in Christ for our salvation, we escape God’s judgment, for there is no condemnation for those who are “in Christ Jesus” (Romans 8.1). 1According to https://www.space.com/, this was the first total solar eclipse whose path of totality remained completely within the United States since the nation’s founding in 1776. Photo captions: 1) Workers clean the face of the Big Ben clock tower. 2) William Wilberforce, the English politician, philanthropist, and a leader of the successful movement to stop the slave trade. 3) The total eclipse. (https://www.space.com/). 4) ANS correspondent, Bonnie Brown, and a group of friends, watching the eclipse in Casper, Wyoming. 5) ANS founder, Dan Wooding, with Charles Gardner during Dan’s visit earlier this year to the UK). About the writer: Charles Gardner is a veteran Cape Town-born British journalist working on plans to launch a new UK national newspaper reporting and interpreting the news from a biblical perspective. With his South African forebears having had close links with the legendary devotional writer Andrew Murray, Charles is similarly determined to make an impact for Christ with his pen and has worked in the newspaper industry for more than 40 years. Part-Jewish, he is married to Linda, who takes the Christian message around many schools in the Yorkshire town of Doncaster. Charles is also author of Israel the Chosen (Amazon) and Peace in Jerusalem, available from olivepresspublisher.com. He has four children and nine grandchildren, and can be reached by phone on +44 (0) 1302 832987, or by e-mail at chazgardner@btinternet.com. ** You may republish this, and any of our ANS stories, with attribution to the ASSIST News Service (www.assistnews.net). Please also tell your friends that they can receive a complimentary subscription to our news service by going to the ANS website (see above) and signing up there. Copyright © 2017 ASSIST News Service, All rights reserved. August 24th is an important date in Protestant church history. 1560 - The Scottish Reformation was made official when what has been termed the Reformation Parliament rejected papal jurisdiction, outlawed Roman Catholic worship and the mass, and adopted a Protestant confession of faith, now known as the First Book of Discipline. * 1572 - St. Bartholomew's Day Massacre in France. Persecution of the French Huguenots began as Catherine de Medici, mother of King Charles IX of France, ordered the assassination of Admiral Gaspard de Coligny. He was attacked early on August 24th, setting off mob action throughout Paris by Roman Catholics. Nearly 3,000 Huguenots were killed in Paris, and perhaps as many as 70,000 across the nation of France. * 1631 - Birth of Philip Henry, an English Puritan and father of the renowned Matthew Henry. * 1662 - The Great Ejection of English Puritans from their pulpits, sometimes called "Black Bartholomew's Day," harkening back to the Massacre of 1572. As Charles II returned to the throne and worked to establish his power over the English nation, the Act of Uniformity required allegiance to the Church of England's Book of Common Prayer. Those ministers who in good conscience could not swear allegiance were forced to step down from their pulpits, thus losing their livelihood and leaving their congregations bereft of a pastor. Over 2,000 Puritan pastors chose obedience to God over obedience to king. * 1683 - Death of John Owen, one of the greatest theologians and Bible commentators in Christian history, whose works ranks with those of Augustine, Luther and Calvin. John Owen was a Congregationalist, not a Presbyterian, but his writings have been of tremendous influence throughout the Reformed world. Throughout human history, God has been at work, sovereignly accomplishing His grand design, which culminated in the death and resurrection of Jesus Christ our Lord. Even now the goal of human history continues under His loving hand, as the dates shown above stand in evidence. God raises up and prepares great leaders for His Church. Or He may allow times of persecution, sometimes employing those trials to move His people on to new fields, as we saw in the Book of Acts. At times the Church may enter into what seem like times of great victory, while at other times the Gospel seems under grave threat. Through all of this, His power, His mercy, His lovingkindness are daily on display all around us. May the Lord open our eyes. We are about to be flooded with an ocean of Dianaolatry. as the 20th anniversary of her demise is upon us. I write lots at the time but have no backups not access to my old emails. I know I made plenty of comment on the corporate madness that engulfed my country at the loss of the woman who to me will for ever be the princess of PR, the woman who complained of her treatment by the media but who manipulated them, especially in the Bashir interview, to very clever effect. This was the 'crowded with three in a marriage' assertion. I do not defend Charles' adultery but I do defend him from Diana's implying he is not fit to be king. This was to hit him where it hurts and where he is vulnerable to the vagaries of public opinion. The fact is Charles possesses the only two essential qualifications to be king. First, he is the eldest legitimate son of his mother. No doubt there. Second, he is not a Roman Catholic. Again he qualifies. Those two are the essential qualifications so Charles should one day become King George VII. an honourable name compared with previous Charles on the throne. One was a pious foo and his son a clever king of dissolute morals, plenty of bastards but no heir. Georges have been a mixed bunch in the past. The first four were German and the fifth divested his family of another German name. He and his son were honourable men and adorned the office of monarch. We are told George V was none too bright but their is no IQ test for kings. The one most dishonourable thing he did was out of self preservation to refuse to give shelter to his cousin in his hour of need. So the Tsar and his family were murdered bu the Bolsheviks. George VI I can remember - well the announcement of his death is the first wool event I can remember. I was five. He was killed by cigarettes and the strain of being landed with the top job when his scurrilous elder brother abdicated both crown and responsibility for a twice divorced woman. The abdication was a blessing in disguise for the country. We got the better man, one fit to lead us through a war. But the strain affected the king's health and he went to an early grave. But in conclusion I must mention the third George. It wasn't his fault he went mad. Was it his fault we lost our prize colony? No I think that was Lord North et al. I still love the film, The Madness of King George. The title was shortened between play and film dropping III after his name lest I am told the Americans looked for parts one and two. So here comes the flood. So far I have heard on good clip. Her sons say it was a family decision for them to walk behind the coffin. That gives the lie to their uncle's complaint that the family should not have made them do it. They chose to. Althorp is not a man to be admired, not after his disgusting funeral speech, the only one where I have heard a relative by marriage run down the inlays. But such was the worship of his sister that the fools in the crowd outside applauded the bounder. Keeping to this year's sabbath principle I fasted from cyberspace today. Instead I read the current Evangelicals Now for which excellent paper I am our church's distributor. It deserves a better circulation for news alone. I also started on a biography of Tyndall but at night reverted to television and St Joh's Passion from the Proms. I overcame my usual anglophone prejudice and really enjoyed it despite the original German. I believe this is the apex of the Reformation musically. Is her any record of how the congregation received this on the Good Friday it was first used in worship at Leipzig? The Evangelist was outstanding but why this fashion for open necked male performers? Fans of the London mayor? We enjoyed two excellent sermons from young preachers, John Young, IPC member, and Chris Roberts newly returned from London Theological Seminary to be assistant minister with. He was outstanding on The valley of the Shadow. This was our last evening service in our present chapel. Only four people present were there when it opened as IPC in 1979. Builders will start now and our new buildings should be readily July 2018. I cooked lunch, cajun chicken with red pepper, sweet potato and courgette mash. I have worn my wedding ring for 48 years but no more. I last had it on my hand in the chapel during evening service. It was about four hours later that I missed it. So if you fine a plain gold band, a man's wedding ring, I will be most relieved. The only thing I feel good about is that I have told Katy and not followed my previous motto of "What the mind don't know the heart don't grieve over. I am pleased to report prayer answered, wedding ring found on the floor by the settee in our front room where I first noticed it missing last night. At the time we were watching St John's Passion from the Proms. Perhaps I had fiddled with it then dropped off to sleep dropping the ring. Lesson learned. Ring is now to stay where it has belonged for 48 years, ring finger. Quiet day at home. Some weeding. Finished Peter Hitchens, The Broken Compass which I reviewed. Sent initial fee payment to our conveyancing solicitor and completed purchase forms. Rom 6 from a mature Oak Hill student at Ealing Lunchtime Talk. I did some weeding, lopping and general garden tidying before we went to visit our new house. But enroute the agent phoned to say the owner had changed his mind and it may be Saturday before he is in for us. The documents have been sent to our solicitor. I am angry with the vendor messing us about. Debbie and I are yet to see the property. My erratic sleep pattern is a trial to Katy. I often am up in the early hours. Sometimes it is due to pain, others I simply do not like to lie awake and idle. I will not detail the exact hours but this morning I was up very early and found I was still sleepy in Bible reading. So instead of returning to bed and the CPAP machine with the possibility of waking Katy, I lay on the settee and slept nearly five hours, a most unusual length of time. I am eating my butter chicken with courgettes that I cooked. I have crunchy rice too as for the first time ever I burned the rice. I scraped it all together only for the ladies to refuse it and cook their own. Then I was told no typing at table by someone cooking their rice. Hence this post goes out now but is really timed at 18:45 on Wed 23rd. At home but active weeding out the front, especially drive and standing. Then some weeding and digging out the back after mowing both lawns. So I am fitter and more active than before hospital. This evening was our last prayer meeting in the IPC Drayton Green lounge. I will post my photographic record. It led me to wonder how long have we been talking of a new building. I think it was some 15 to 20 years ago we had a congregational meeting that voted for the redevelopment of our site as against renting premises. I recall saying they could go ahead without my input as I have no interest in bricks and mortar. I said I would return in 10 years to see what they had but. It seems my 10 years was a gross underestimate. I think these are our third firm architects. Some more weeding, digging and lopping this morning after a walk to the post office and back. Lunch with Adrian's parents, our monthly meal in Ruislip. This time we enjoyed the company of our grandchildren. We have new bathroom scales. Weight loss continues with 28lb gone since the heart problem was treated. Beautiful day. A bank holiday weekend cannot go on like this. Community cardiology consultant thinks that sometime after my March surgery I had atrial fibrillation again and the irregular beats caused the heart failure. But he reckons I am doing well and he will monitor me. I certainly feel fitter now and have continued gardening etc today. I had hoped that Debbie and I would get to see our new place this weekend but once again the vendor has put us off, this time until Monday. This is frustrating as I planned to go to watch Surrey and Middlesex at The Oval. But today was most interesting for it was removal day from our Drayton Gerren premises. See photos on Facebook. Katy thought I was not fit enough for four hours work but I wanted to do my bit and managed to be set a sedentary task of sorting the files in one storage cabinet. Some were our minister's personal ties for his work. Those were in order in the main but I had to look through church files dating back nearly forty years. I have finished up bringing these ones home for proper orderly sorting but among the gems are a 1919 annual report of the St Helena's Home and its ministry among first offending young women and also pictures of the chapel as it was before the Anglo-catholic nuns sold it to us iconoclastic Presbyterians. I had wondered when we first proposed to rebuild our site. The answer was found in a letter of early 1990. So we have been over 27 years planning for this new build due to start September 11. Tonight I cooked beef rending. Very tasty.